Nebula Collection by Bestar is the ideal solution for organizing small spaces with multiple purposes. With crisp, modern lines, create your dream layout by combining the different units to meet your needs according to the available space. This kit includes two 25 inch storage units, two doors, one 3-drawer set, a base unit and a bridge. Each 25 inch Storage unit has 2 fixed and 3 adjustable shelves to maximize your options. The base unit has 1 adjustable shelf. The reversible doors provide closed storage on bottom or upper section of the storage unit. 6 clothing rods are included in this kit. Easy to install. Assembly required. Honey-Can-Do WRD-01898 46" Cloth Wardrobe. This 46-Inch wide wardrobe and storage closet provides an amazing value for storing your garments, off-season clothing, and other hanging items. A heavy-duty steel rod provides ample hanging space while the breathable, lightweight cloth cover completely surrounds your garments, protecting them while in storage. A handy top shelf offers additional storage space for shoes, folded garments, and other items. A peek-through top window provides quick visibility to contents and full-access zip closure opens for easy use. Top and bottom of wardrobe are fabric. 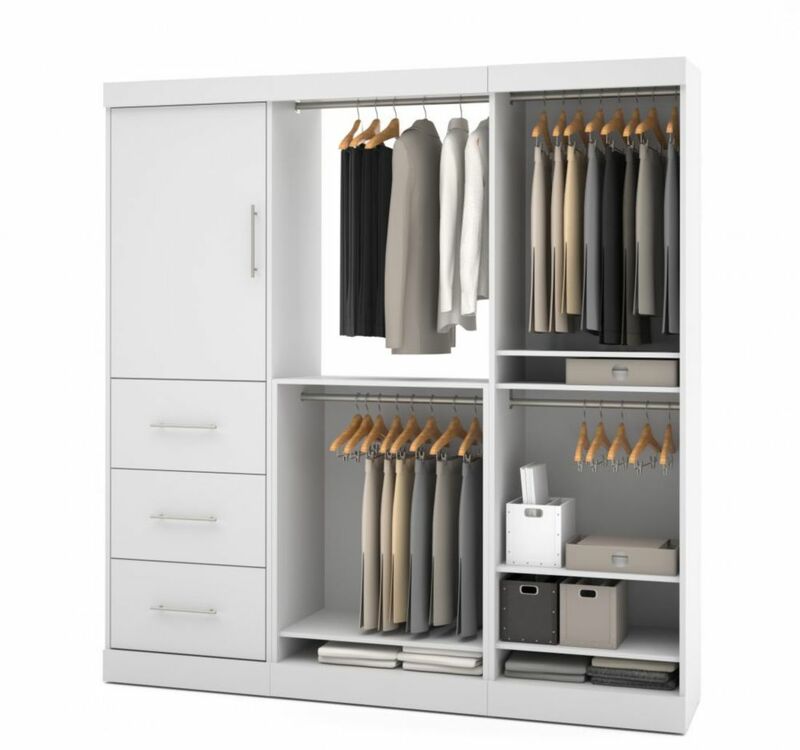 Protect your clothes with this 36-inch Wardrobe. Great for storing off-season styles, special occasion wear and more. A heavy duty steel rod provides plenty of hanging space while the breathable, lightweight fabric cover surrounds your garments to keep them dust-free. The wardrobe features a peek-through top window for visibility and a centre, full-zip closure for easy access. Featuring ample storage capacity, the Honey-Can-Do White Storage Closet measures a generous 60-inch wide and is ideal for extra hanging space or seasonal storage in an attic, basement, garage or laundry room. The high-capacity steel rod holds dresses, shirts, pants, coats and other items, while the breathable, lightweight fabric completely surrounds your garments to protect them from dust and debris. Offering easy and convenient access with 2 D-style zipper doors, this closet is durably made with a heavy-duty steel frame that is sturdy and rustproof for years of reliable use. The Eldridge enters the market showing that it is possible to develop an economical product, while maintaining quality and design. Its measurements are perfect for the new concept of homes, which feature increasingly smaller spaces for bedrooms. Its compact shelves, drawers, and aluminum rods allow you to neatly fold or hang items to keep things organized, and out of sight. With everything you could need in one neat condensed space, this modern wardrobe with sleek chrome handles that take up the bottom half of the doors is perfect for any smaller bedroom. Choose between different warm and inviting modern finishes to compliment your bedroom. The Eldridge features a Pro-Touch High definition, ultra-resistant finish with the texture of natural wood, and stylish wood pattern as well a High Gloss finish. The unique paint is protected by the Microban Antibacterial Protection. Nebula 80 inch Storage kit with 3 drawers - White Nebula Collection by Bestar is the ideal solution for organizing small spaces with multiple purposes. With crisp, modern lines, create your dream layout by combining the different units to meet your needs according to the available space. This kit includes two 25 inch storage units, two doors, one 3-drawer set, a base unit and a bridge. Each 25 inch Storage unit has 2 fixed and 3 adjustable shelves to maximize your options. The base unit has 1 adjustable shelf. The reversible doors provide closed storage on bottom or upper section of the storage unit. 6 clothing rods are included in this kit. Easy to install. Assembly required.